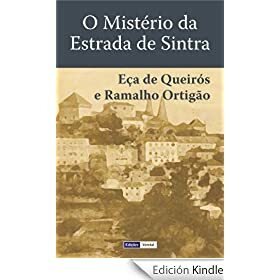 The Mystery of the Sintra Road (original title: O Mistério da Estrada de Sintra) is considered the first detective story in Portuguese. The novel was written in 1870 by José Maria Eça de Queiroz in collaboration with Ramalho Ortigão and published first by instalments in ‘Diário de Notícias’, a Lisbon newspaper, between 24 and 27 September 1870. At the time many people believed it was a true story, as it happened in 1938 with the radio broadcast of The War of the Worlds by Orson Welles. Two friends were kidnapped on the road to Sintra by three masked men and taken to a mysterious house. In the house there is a corpse. The usual questions arise: Who was he? How did he died? Was it a natural death or a murder? Who was the perpetrator or the instigator of the crime? The two friends are the two narrators, Eça de Queiroz and Ramalho Ortigão, whose story was published in the form of letters to the editor recounting what happened to them. In 2007 O Mistério da Estrada de Sintra was made into a film. At Fantastic Fiction you can see the bibliography of Eça de Queiroz available in English. El Crimen del Padre Amaro (2002), a film directed by Carlos Carrera is a free adaptation of another one of Eça de Queiroz books The Sin of Father Amaro aka The Crime of Father Amaro (1875). José Ignacio.- What an interesting-sounding story. And I have to say that it really appeals to me that this is the first detective story in Portuguese. It doesn’t sound easy to find, but it sounds like an interesting mystery. Margot I forgot to add, and this might interest you, that the story was written among the two writers as letters to the editor. Each one answering to the previous one without a former draft and gradually the story unfolds. José Ignacio – Oh, you’re right; that does interest me! I’ll have to see if I can find this one. Margot I’ve downloaded it in Portuguese free from http://www.gutenberg.org/ebooks/20574 Afraid it’s not available in English. Thanks for a really interesting post. Do you know if the writers were influenced by translations of English, Spanish or French detective fiction, or was this a completely new idea in Portuguese? Margaret Jull Costa is translating this novel for Dedalus Books. I know a few people who’ll be happy to read it in English.